This 4770 square foot multi family home has 9 bedrooms and 4.0 bathrooms. If there are 9 bedrooms why on earth would the girls have to share a room in the basement...unless...they rent part of the home...if so, who else lives there? Gotcha...I just took that as maybe they could still own the entire thing since no one else has been mentioned...it seems they would have mentioned people living in that building/house. It would be nice to know who else stayed there. My understanding was the family lived on the first floor..and I think that would include the basement. Evidently the upstairs had been turned into and apartment. That's not unusual with old Victorian homes. However what is unsual is using the basement as a bedroom or anything other then a laundry room due to the lack of headspace..normally they have dirt basements that when rehabed are cemented over and then used as a laundry area..not a bedroom area. Favorite Quotations "if you ain't drinkin you ain't thinkin." I'm sorry, I just laffed out loud at this azzhat. Tyler Noyes FB wall. I think I must be tired. Goodnite all. (CNN) -- One week after 11-year-old Celina Cass was last seen, her body was found Monday by divers searching the Connecticut River, New Hampshire Senior Assistant Attorney General Jane Young said. "We have brought Celina home, not the way we wanted to bring her home," Young said early Monday evening. The girl's father, Adam Laro, said he was heartbroken and grasping for answers after hearing the news. "I ... can't believe what's gone on," Laro told HLN's "Nancy Grace" show on Monday night. "I have no fingers to point ... I hope there will be some answers, that's what I'm asking." Wonder if this place has a camera outside? Its not too far from the home. Yeah, I saw that...wonder where he came up with that motto? Can't keep my eyes open. I keep dozing off goodnight monkeys. I am wondering that myself. I am also thinking the owner is the lady that has been organizing the vigils and talking to all the fols in town. I am also thinking that Celina and her abducter did not walk by there that evening..but maybe it shows a certain car going by there..but that proves nothing ..unless the owner does not have an alibi. Good night Titch..good night sweet monkeys.. Yes, exactly. I am sure the police gathered all of the video from that night (if there was any)...wonder if they were able to catch that red truck in any of them? Geeze .. 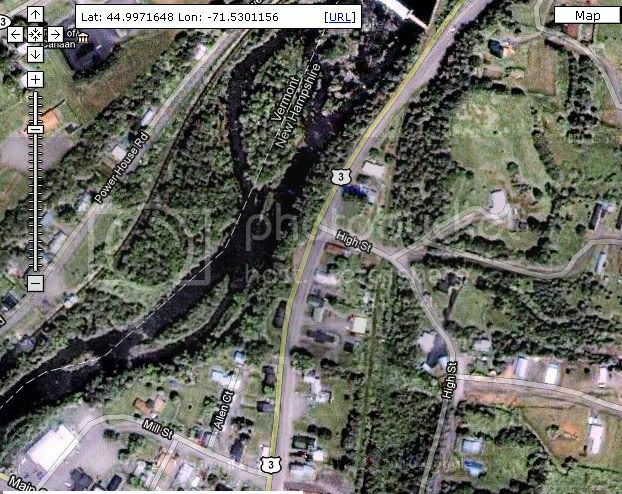 The map shows how close Celina was found to her home..
Down to the left bottom is Main Street and US 3, Up top above the words Vermont and New Hampshire the dam is white Bar..
"Speaking on the condition of anonymity to www.blinkoncrime.com, sources inside the investigation have confirmed that electronic forensic evidence led to Celina’s recovery today." Could it be the computer forensic on the computer that Celina was using? Computer forensics involves the preservation, identification, extraction, interpretation, and documentation of computer evidence. The field of computer forensics has different facets, and is not defined by any one particular procedure. At a very basic level, computer forensics is the analysis of information contained within and created with computer systems, typically in the interest of figuring out what happened, when it happened, how it happened, and who was involved. I thought that Celina and Kayla were 1/2 sisters. So why would Kayla's last name be the same as Celina's dad but Celina's is Cass. You're not alone in the confusion department. I cannot figure it out, either. I have done lots of geneaological research for years, and this either group has me . The only thing I can see is that possibly Mom was mad at Adam Laro (while pregnant with sweet Celina), and just decided to divorce, have the baby, and give Celina her maiden name of Cass. I did catch the re-run of Nancy Grace tonight (with Deborah Norville, who I agree, didn't have a clue) but anyway it answered one question for me. When Lero was asked if he found anything suspicious going on in that house, he answered that he asked his daughters and they seemed okay. So that means that both Celine and Kayla are both his daughters. It kind of surprised me because I don't think they look anything alike. Some things still bother me. Lero said that one time when he visited and spoke with stepdad, he voluntarily got out the girls' report cards and showed him how well they were doing in school. (This speaks to me as someone who protests too much - providing unsolicited information). Lero was also asked and didn't know if Louisa and stepdad were married. I'm not trying to be mean or nasty but let's be real, we are not dealing with rocket scientists here. At this point, I do feel sorry for Lero, Kayla and of course, Celina. Period. I'm probably way off base on this one but I could swear that I read that the building right next door (the big white lodge) said that it was a Bed and Breakfast. I'm sure the police have checked out anyone who was staying there at the time. Most importantly, I still don't get why stepdad is still in the hospital - as far as we know. Does anyone else find it suspicious that absolutely nothing is being said about his medical condition? Funny about Spa Restaurant, Tyler Noyes grandmother (Lindsay Woods) works/worked as a cook at Spa Restaurant. I have the facebook link but it shows up as my own page so I'm sorry I can't post it. ADAM LARO, CELINA`S FATHER (via telephone): I want to say thank you to all the authorities and all the people that have put the time and effort to look (INAUDIBLE) putting their time and effort in looking for my daughter and being able to find her under the circumstances which we were hoping we weren`t -- it wasn`t going to turn out this way. But I -- a lot of thanks to get to a lot of people, and even the townspeople that have put their time in there for putting signs up and stuff for me and for the family to help us all out. Page created in 2.182 seconds with 19 queries.